Scientists at Berkeley have created a new "Tree of Life." You have probably heard of Charles Darwin. If you haven’t, you might have heard of his book, titled On The Origin Of Species. It was published in 1859 and led to Darwin becoming one of the early pioneers of evolutionary theory. In this book, he envisioned a “Tree of Life,” which is essentially a map of the history of evolution shaped like a branching tree. The Tree of Life isn’t really the best metaphor for how evolution actually works (indeed, if we must use a metaphor, a spider’s web may be a better image—a twisted, chaotic mass of diverging lines and broken wisps the radiate outwards). Nonetheless, the image of the Tree of Life has its uses, and it has led many biologists to trace (or attempt to trace) life on Earth in image form. The discovery of DNA sequencing allowed scientists to view the precise order of nucleotides in a species’ DNA. This showed scientists the genetic relationships among different species. These discoveries are what allowed Carl Woese of the University of Illinois and his colleagues to publish the first-ever “Tree of Life” in the 1970s. 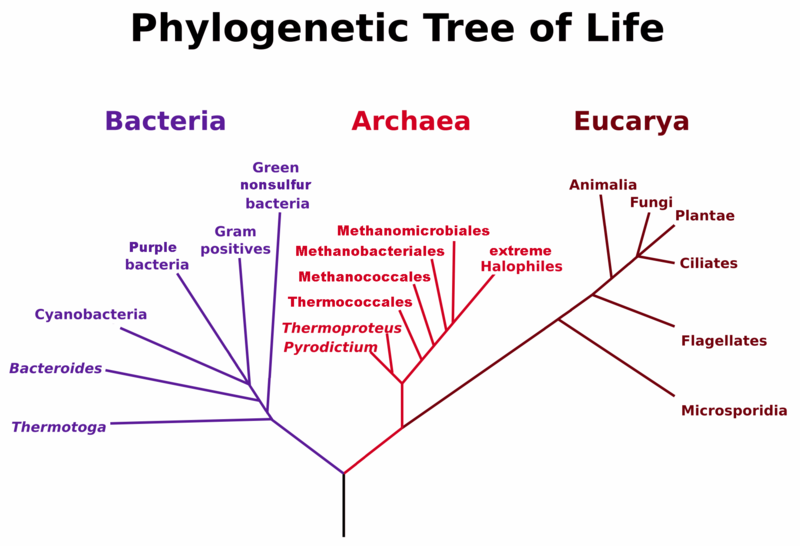 Their “Phylogenetic Tree of Life” has three trunks, each labeled as Eukaryotes, Archaea, and Bacteria. The eukaryotic trunk houses the animals, plants, fungi, and protozoans. The bacteria trunk houses most commonly-known single-celled organisms, such as E. Coli. The Archaea trunk houses extremophiles. Armed with this basic start, scientists have long been trying to add to the tree. Now, Jillian F. Banfield of the University of California, Berkeley and her colleagues found a new method…and a new Tree. They’ve been collecting microbial species in nature and disassembling and reassembling their genomes. They’ve effectively created hundreds of new microbial species, which you can see in the the remarkable “Tree” below. Their findings are published in the journal Nature Microbiology. 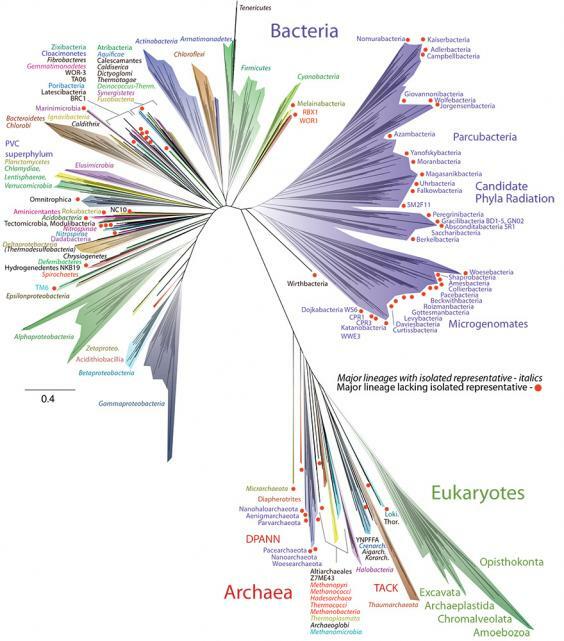 The entire history of eukaryotes (from amoeba to human) fits on one single, thin twig. This solidifies the notion that eukaryotes and archaea are closely related. But bacteria make up most of the tree’s branches. And a lot of the diversity exists right under our noses: “Meadow soil is one of the most microbially complex environments on the planet,” asserts Dr. Laura Hug, one of the researcher in the study. One long, skinny branch at the base belongs to a group of bacteria that seemed to have barely evolved since their beginning. This shows “survival of the fittest” and “adapting to suit one’s ecological niche” at its finest. That said, there are some concerns about the new tree. Patrick Forterre, an evolutionary biologist from the Pasteur Institute in France, explains that the DNA collected from the field might actually be chimeras, already made up of different species. This would surely be an issue in splicing genomes. But even with the concerns, Dr. Banfield doesn’t believe there will be much development on the bacteria side. If anything, we’ll see more evolution in eukaryotes. How many more unknown species are hiding right under our nose? We don’t know exactly, but there’s definitely a lot more to discover.